A Delta Mileage Run recap – how did I do this latest round! Now I am very used to a “uniform” look when I’m working at my real job, computers. I have a set of long sleeve shirts with my company name on it for winter and similar logo short sleeve ones for summer. Basically I wear the same thing every day for “work”. I have a bunch of Delta Points shirts too and I wear them whenever I fly. Why? In a geeky way I think it is kinda kool and for “work” reasons it opens doors and questions come up and I have a chance to “chat up” Delta personnel from FA’s to Redcoats to front line agents. All love to chat and talk Delta. Oh how I love it! I don’t believe in silly things like fate, but I have to tell you I was not pleased to get on a CRJ and find the above. 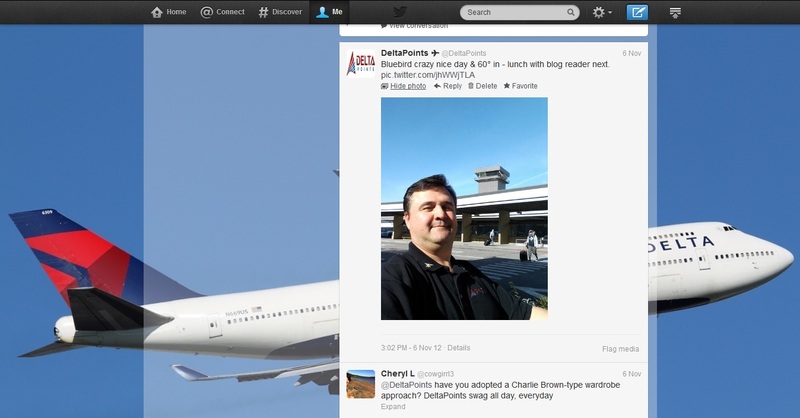 Readers know I despise CRJ’s and blogged about their demise on the way nearly a year ago. I long for the day I never ever have to get on a 40/50 seat bird in my life again. 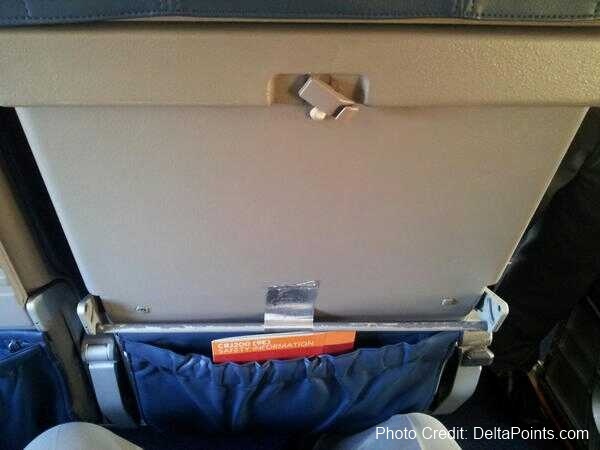 So starting with a missing tray table, and the only thing holding the sides from falling down and becoming a complete safety risk to me and my seatmate was a tiny piece of duct tape. Oh Delta, how long will you put up with this kind of airline flying with your name on the side of the planes? I almost did none of the above. I did day one as planned. Day two, I changed free under the Sandy free change rule. I changed to pit-msp-slc-lax-atl-pit. I then used a SDC to extend my stay in SLC so Steve and I could both enjoy lunch and go snipe hunting (AKA “OTHER office supplies” field trip). Then, my ATL flight was oversold. JOY! I took a $400 bump and was put, again, in Y class, so was upgraded on LAX-MSP and same thing on MSP-PIT. A good start to my run. Day two started leisurely around noon and even better. 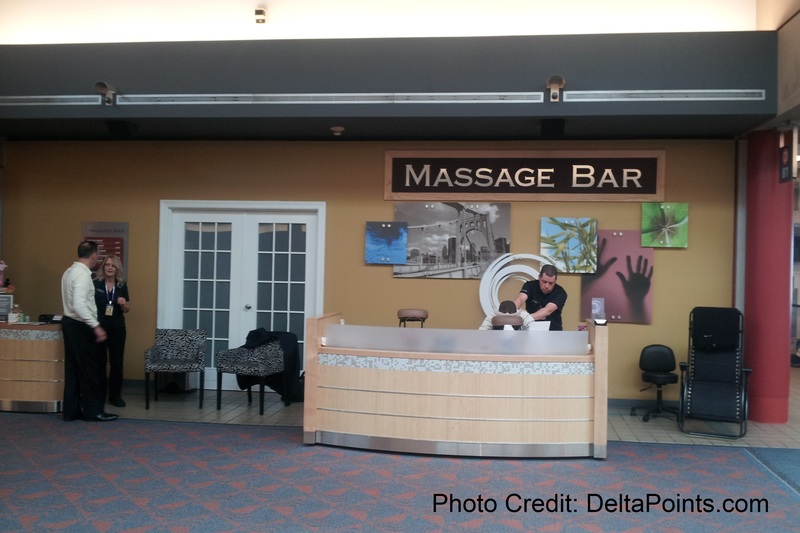 I got a quick chair massage (they take Delta meal vouchers btw) and had a Yingling beer at T.G.I. Friday’s just across from my gate so I could stalk it for when it opened up. As soon as I saw a rep there, I put myself on the bump list in #1 position. It did not look like I was needed until a Redcoat said we need help, but they only offered $200. What? No thanks! But I told him I would be HAPPY to bump for FREE if I could get a Y class rebook on the flights I was moved to. He said since you are being so nice and bumping for FREE, I will just rebook you in 1st class. Uh, OK! SOLD! So, I was booked on all 4 of the MR #2 in 1st and the ATL-LAX was a BE (Business Elite) configured bird. They ended up short staffed due to the bigger plane, but it was nice to get the old style BE seat instead of the std domestic 1st class seat. Food was nice and it felt like an international flight! I land in LAX and go right to the Skyclub for a shower (tip take the stairs much faster). Oh was that nice after this much flying. For those who do not know, showers are free and everything you need is in there. Shampoo, tooth brush, hair brush, razor kit etc etc. I always leave a tip when I leave as I appreciate the cleaning crews working all day long, flyer after flyer. 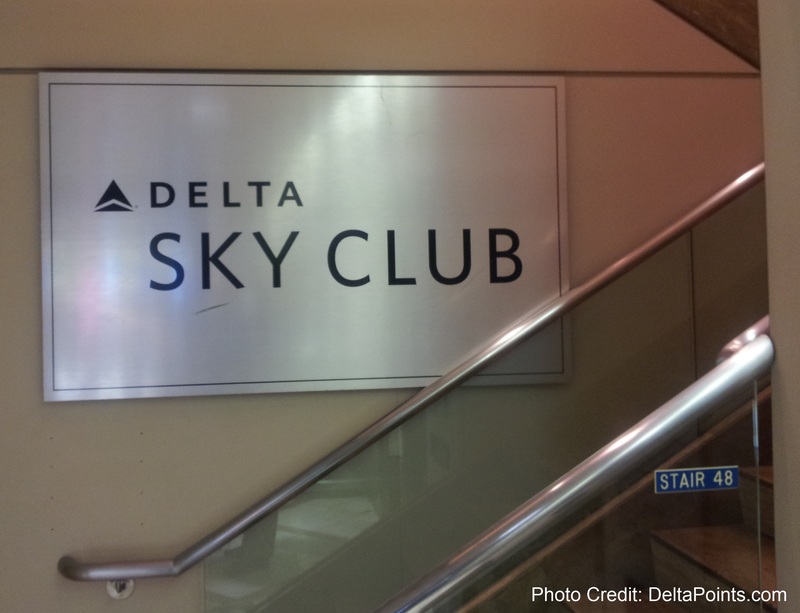 If you are not enjoying the Skyclubs when you travel, you are missing out big time! Me – Are you oversold. Rep – YES! By 6, do you want to volunteer? Me – YES! But I want to be in 1st on whatever flight you put me on. Me – OH. I am in 1st on this flight. Rep – Great, then sure we can do that. 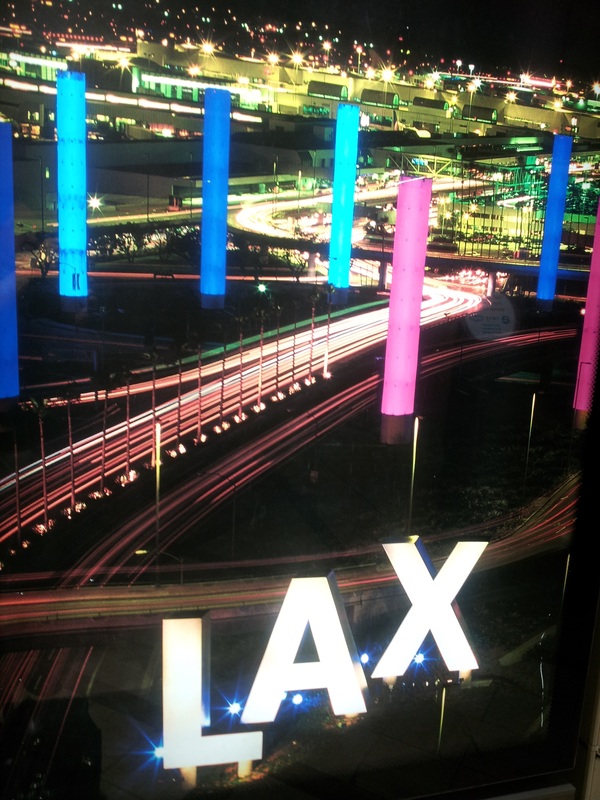 How about LAX-DTW it leaves 15 min after this one. Me – OK great, so $400 and I have to wait 15 min. OK! Can you pull me now since that flight leaves soon? Rep – Yes here is your ETV and your new boarding passes. At this point, after almost 48 hours of flying, I am feeling a bit stupid and sleep deprived, but cannot stop smiling. I have taken 3 bumps in 2 days, scored $800 in ETV’s and 4 free 1st class upgrades. This has been a fun run. I have spent one of the ETV’s already for my SBN-DTW-PIT repositioning flights for my last run in a bit and paid just a bit more as I wanted to test how a “K” class fare, one level over the LUT class, will affect my position on the upgrade list. I should be higher than (edit: everyone but) Diamonds in that bucket so it will be fun and was worth $65 all in over the ETV for the test. All in all I took 13 flights. Three were CRJ’s. Six of the other ten I was in 1st class. Again, the total I paid for this two day run was $274 with Delta’s money (plus the repositioning flights with Delta’s money too). I hope you are all seeing the possibilities of a good mileage run and bumping when doing so. I do have some data points about bumping. 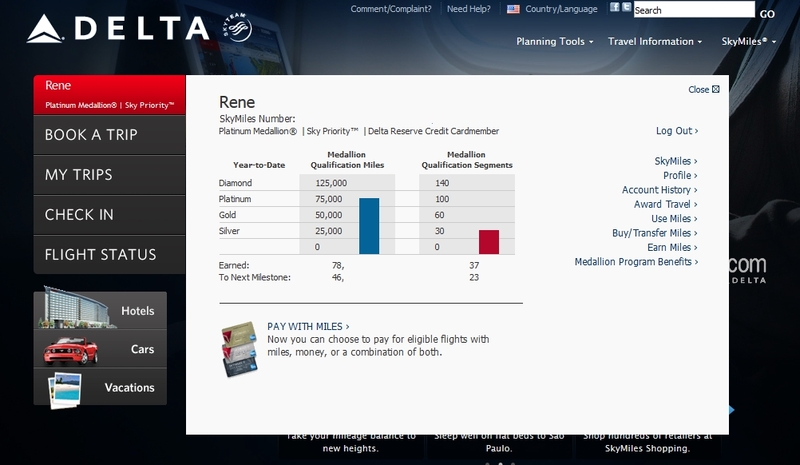 It would seem, since I am only going on observed data, that Delta CORP is pushing the $200 vouchers. So many times I heard we are oversold and you can get $200 like the ATL-LAX flight that I said no to giving up my seat. 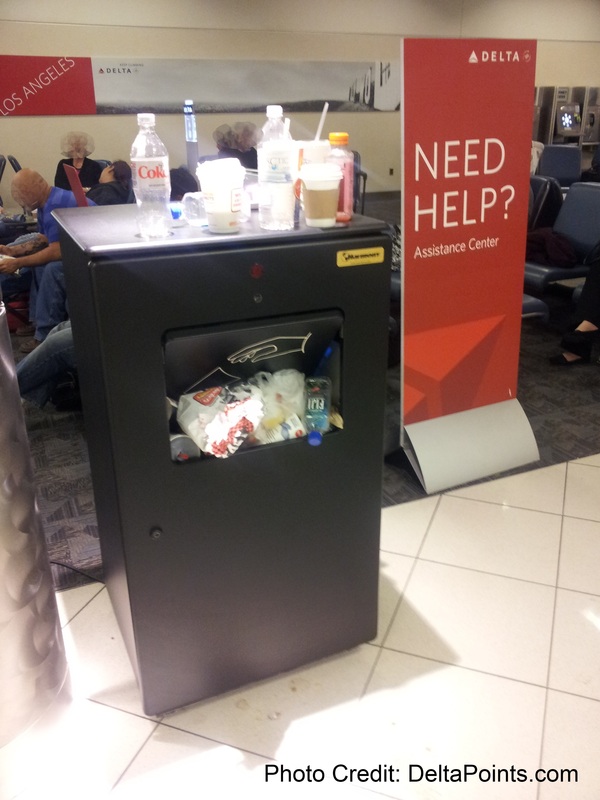 I did suggest to the agent I would give mine up for $400, but I would need 1st class on next flight and she said NO to both of these requests so I took the flight and was happy I did (I did find this trash can kinda funny and summed up my feeling of this gate agent). Many times when I checked in online or at a kiosk I was electronically asked if I want to volunteer to give up my seat and to bid, I always pick $400 as this is the lowest number worth a bump to me, but nothing trumps the gate agent hand writing your name as the 1st one to call if needed. While they do see the electronic volunteer list, in practice they do not use it and will stick to the $400 or $200 number. ← How to entertain yourself on a 48hr mileage run!?! Go on a points field trip! Wow. Amazing. I wish someone like you was doing the same thing with united or American. Curious why the loyalty to delta. Is it mainly that ur at a hub bc everywhere I read ppl are saying delta sky miles aren’t worth investing towards. Interesting post. Thanks. Oh and add four points Peoria Illinois to your “do not stay” list. Not the worst hotel I’ve ever stayed at but not worth the effort either unless you are really attached to 1981 decor. @DaninSTL – my BIG thanks for your comment. I am working on my hotel post now. As a PM you will not be higher on the upgrade list than any DM on any fare class other than full Y. @haloastro – correct, as CWSI.net shows with their handy chart, http://cwsi.net/mupc/, but I will trump anyone PM or lower class than me and with my Delta AMEX Reserve card I will break all ties with the same fare class! cool! thanks for responding. I’ve started to research more of your “Essentials” and also review the elite status with Delta. Am I missing something with elite status? I see that if you have the highest levels you get 4-6 system upgrades, etc. 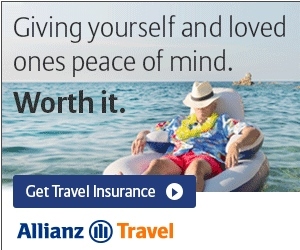 But I don’t usually buy my international flights but use award flights. Maybe I fly 2-3 times a year domestically. Do you think elite status would still be worth it in my case? @Ryan – great I hope you enjoy the blog. Now coming from other airlines, you need to learn that one of Delta’s biggest faults is the SWU program. They are very bad and hard to use. Not worthless but it takes work! Most elites pick another “gift” for their status award. But, Silver Medallion is simple to reach and Gold+ give you a ton of perks and some upgrades. Platinum and higher and you will see a bunch of free domestic upgrades. 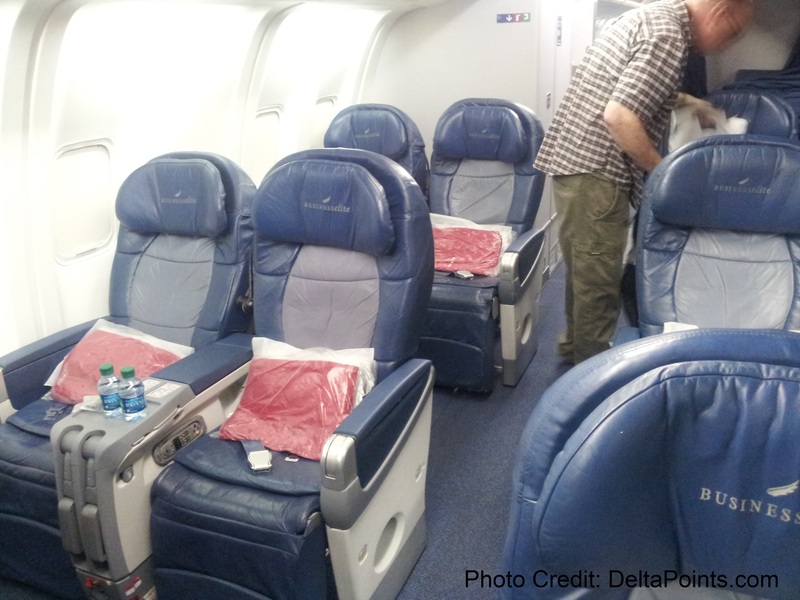 Delta does not give free upgrades on INT flights.